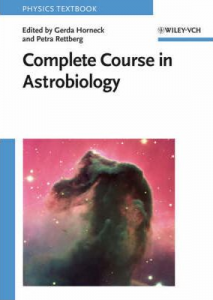 The Complete Course in Astrobiology, edited by Gerda Horneck and Petra Rettberg, is written up from a lecture course from late 2005, taught by tele-network and sponsored by the European Space Agency. The book includes the eleven lectures on a CD (while the book is extended by two more chapters), and the lectures are available for download, which would likely be of more use than the bare slides. The project has commendably brought together a very multi-disciplinary group drawn from seven European universities, and the breadth of topics covered is impressive. The book launches in with the nature and origins of life and some extraterrestrial context, followed by chapters on interstellar chemistry, pre-biotic chemistry, and evolution to cellular life. There is a nice progression to extremophiles and habitability, with the second half of the book moving on to Solar System habitats. The usual suspects are covered, with individual chapters on Mars, Titan and Europa, plus a description of the future ExoMars mission. Interestingly, the book is rounded out with material on astrodynamics (how to launch a space experiment), facilities for low Earth orbit experiments, and planetary protection. To me these were novel in an astrobiology textbook and these three chapters added a lot of interest, though students might skip them in search of more ‘core’ material in the subject. Overall I found the book impressive – it balances length, going into enough detail, factual correctness and comprehensibility starting from zero knowledge about as well as could be done. As a textbook I think it works well as a draw into the subject, with lots of intriguing and even quirky material (how about a plot of optimism on habitability versus time, anyone?). The various chapters by different authors do well in keeping to an even level and are nicely organised and sectionalised, for which much credit to the editors. The book is very thoroughly illustrated, including colour images, and the copious diagrams used are very good for explaining the concepts. Inevitably some material has only shallow coverage – good lists of articles for further reading are supplied though I doubt if students would have easy access to journals covering so many disciplines. The questions for students at the end of each chapter are variable; the descriptive ones do not add much, but the calculations in other cases would make very useful exercises (setting test questions in astrobiology is always a challenge). I would recommend this book highly for dipping into and for a group library. Some of the more unusual material would be hard to scrape together from other sources and is particularly useful to have in one place. At around fifty pounds, it is a good purchase for a new astrobiologist or student expecting to study astrobiology in depth.